1. Pre-heat oven to 275 degrees. Rinse the chicken & pat dry. 2. Put veggies in bottom of roasting pan(s) along with broth. 3. Place chicken BREAST DOWN in the pan on top veggies and roast at 250 degrees covered for 3 hours. 4. After 3 hours, turn HEAT UP to 375, flip chicken to BREAST UP, baste the skin and roast for another 45 minutes UNCOVERED until golden on top. 5. 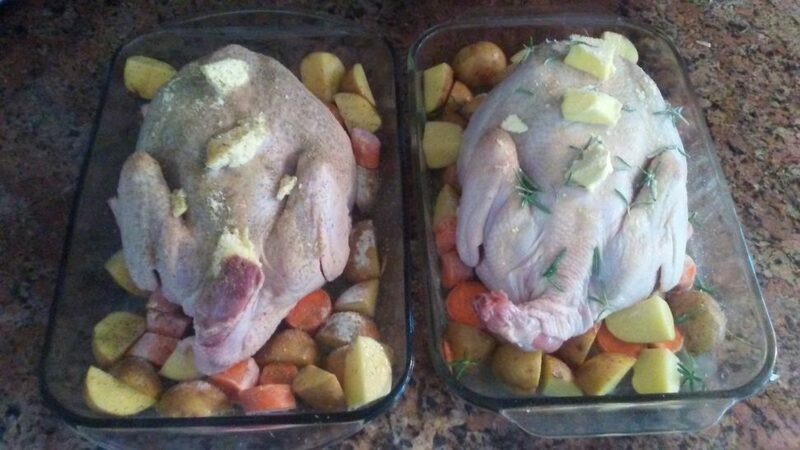 Let your chicken rest for a few minutes out of the oven before cutting. Enjoy deliciousness!!! eat lots of pastured chicken around here. I think the biggest mistake I made in the past was over cooking it, which made the breast dry. 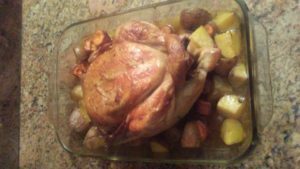 Pastured chicken cooks differently. Always cook it LOW and SLOW!!! So yummy! and soooo healthy! 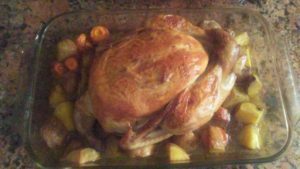 What is your favorite pastured chicken meal? We would love to know!